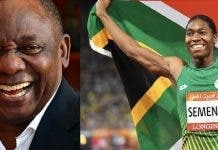 While Team South Africa goes for gold at the London Olympics later this year, their supporters will go green and gold every Friday in support of the squad. Team SA Fridays, as the latest national supporters’ campaign is known, will kick off on 20 April, while the official supporters’ T-shirt will available at the beginning of May at leading clothing retailers. The Department of Sport and Recreation, together with the South African Sports Confederation and Olympic Committee (Sascoc), announced the campaign at Gold Reef City, south of Johannesburg, on Wednesday. The glittering event was held to mark the 100-day countdown to the Olympics, which starts on 27 July, and the choice of venue was to symbolise the gold medals Team SA will be aiming to win at London’s third Summer Olympics. 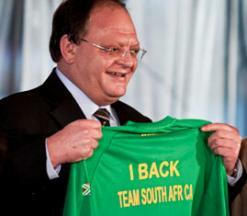 The idea behind Team SA Fridays is in keeping with the tradition of uniting South Africans in support of their sporting heroes by marking Fridays as official supporters’ days. Sports fans are asked to wear the designated T-shirt, or the shirt of any national sports team, at home or to work on a Friday. If the success of the campaign’s cousins, namely Football Fridays, Fly the Flag Fridays and more recently, Magnificent Fridays is anything to go by, it will soon become the norm for South Africans of all ages to be seen everywhere donning the green and gold shirt. 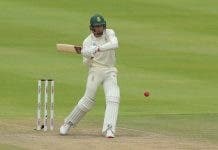 To help spur on supporters – as well as the team as they compete against the best in the world – Sascoc has enlisted five well-known sporting personalities as Team SA ambassadors in the build up to, and during the world’s largest sports gathering. They are Springbok Sevens superstar Cecil Afrika, former Bafana Bafana captain Lucas Radebe, golf veteran Ernie Els, retired Proteas cricketer Makhaya Ntini and former sports presenter Cynthia Tshaka.